We teach with kids on their feet! This program is for children ages 4 to 9 yrs old. Our class teach the A,B,C’S of Fitness (Agility, Balance, Coordination and Strength Training drills) while integrating literacy and mathematical skills in 90% of our curriculum. improving on motor skills, hand-eye coordination. Children will learn the A,B,C'S of fitness (Agility, Balance, Coordination and Strength & Flexibility). This program allows children to explore new activities as it's an intro to all sports! Children will learn an overview of skills for soccer, basketball, baseball and more. We cover catching, throwing, passing dribbling and agility skills. Children learn a combination of flips, rolls, jumps, and twist. Strength and agility are tested through obstacle courses and various training techniques. The levels of participants are defined by the sweat wrist-band and coded by primary colors. This class is for families with children, ages 18 months to 9 years old. You’ll set a great example for your kids. Children learn behavior by what they see around them so be a positive role model and lead by example as you bond with your little ones. Being a parent is the most important job you will ever have and being a healthy and positive role model is super important. As a parent it is important to make connections with your children as well as other parents in your community. 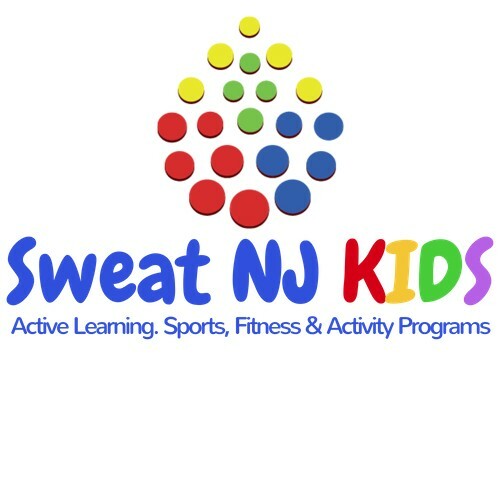 At Sweat NJ KIDS, we help you do both during our Fit-Together classes. 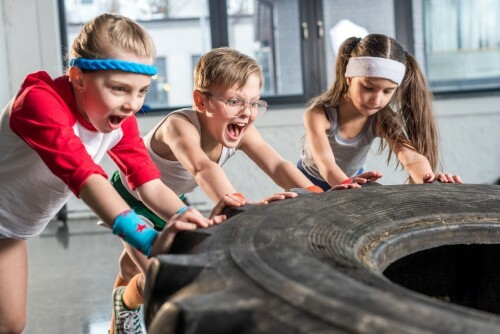 Fit-Together classes allows parents/caretakers to bond with their kids on another level, it also helps build friendships with other fitness minded parents. This class is structured to strengthens the Parent/Child Bond and connect on a different level without the pressure of parenting. Here you can relax and have fun with your little ones. Laugh and play with each other as well as learn what your child likes and dislikes with regard to play and sports. Discover your child’s talents together. Besides connecting you with the little guys, you’ll be connected with others in your community. You’ll meet with other fitness minded parents and meet in our class for an organized, fun fitness-play date. This program is for kids 9 yrs and up! It has been proven that regular physical activity can help growing kids, sleep, eat, socialize and focus better at school. While building strong bones and muscles, control weight and reduce the risk of developing health conditions. Our award-winning curriculum, integrates literacy and mathematical skills in 90% of our programs. Our unique concept, offers children ages 0-12 not only sports and fitness but language, music, wellness and science too! Safety is key, all instructors are background checked, fingerprinted, trained, certified and are professionals of their field. We strive in parent satisfaction and truly love what we do! We offer variety of unique programs, parties and events at Schools, Fitness Centers, Communities and MORE! Our program and professional instructors come to you!